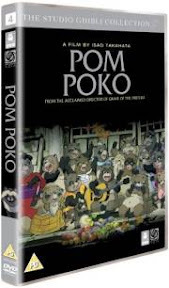 Watched Pom Poko (Heisei Tanuki Gassen Ponpoko) with my girls on Sunday... and absolutely loved it. There are so many dimensions to it... the girls love the cute raccoons and their antics as they fight back against the humans who have taken their land. I loved the eco "message" of protecting the environment... and our stewardship responsibility for creation. Its a tremendous film with great humour and characterisation... that explores Japanese folk legends about transforming raccoons or tanuki. I love the way they "haunt" the humans in an attempt to scare them off their land... or need energy drinks to keep their strength up. All in... we all enjoyed the film and are grateful, as always, to The Soos for the gift... and wish him well for his future.